The other evening, I came home in my aunt's old car, and fished a large melon from the passenger seat before carefully locking the car. The melon was football shaped with a nice heft and a beautiful pattern on its skin; my aunt had given it to me as part of a string of exchanges that would have impressed David Graeber, the anthropologist author of "Debt: the first 5,000 years", in which he describes various forms of social, non-monetary debt. Earlier this spring, my ancient dad had a small car accident. Nobody was hurt: he had caused his car to scrape by a sidewalk pole. I think the pole, a sturdy concrete thing, wasn't even hurt. Only the car needed body work. The thing was, that - being ancient - my dad hadn't noticed that he had caused the accident, and had gone on his merry way home. The owners of the sidewalk pole had followed him, noted his license plate, and called the police. Who duly showed up at his house to investigate. Long story short, they took away his driver's license, and gave the car keys to my cousin Ben, who had shown up to help out my dad. It was the perfect wake-up call, and finally persuaded my dad to give up driving. We're still dealing with the aftermath: the trauma pretty much took away his ability to speak, as if the loss of mobility took him to the infant (literally meanin "non-speaking") state. It also meant that he had to give up his car. Right around then I hear that my aunt, Ben's mom, was looking for a car to replace her old one that she had trouble getting into reverse gear. Ben had been giving my dad rides regularly, so it seemed the natural thing for my dad to give his car to Ben's mom, in a mobility swap. Ben took the car to a body shop, transferred the ownership and the insurance, and my aunt was mobile once again. My dad's car didn't have the acceleration of hers (my lively aunt appreciates a bit of oomph) but it had the automatic transmission which was kind to her ailing knees. She was very happy. One day, just after she had dropped by my dad's house with some yummy treats, a policeman rang her doorbell. It turns out her newly acquired car had been torched, probably in an act of random vandalism. The matches were still lying next to the wreck. She sent me a frantic and barely legible email - I didn't think an electronic missive could be so breathless, she was so upset. When I saw the photos I could understand why she was in shock. Meanwhile, Ben had had the transmission in her old car fixed, so that all the gears are working again, albeit with probably more wear than before. She drove it for a few days, but her knees were acting up. So she decided to be car free until her knee operation this September. Meanwhile, she offered me the use of her car while I'm in the Netherlands this summer. This way I can bring my dad where he needs to go, and Ben gets a chauffering break as long as I'm in the country. I had actually been researching a car-share scheme called GreenWheels, and had even found a place where you can borrow a wheelchair attached to an electric bike, as alternatives for getting him around. Each option would have been an adventure, but cumbersome in practice. So I was very grateful to accept my aunt's offer; and my dad is very happy: for him, nothing beats a car for comfort and on-demand availability, even if I'm the one driving it (I guess he's got on-demand dibs on me). Meanwhile, my aunt's knees are hurting her. Her friend is lending her a wheeled walking aid but it's too tall, and leaning on it makes her shoulders hurt. So the other day I fished my dad's walking aid out of his basement where it's been languishing - he's far too stubborn to use it - and brought it to her house (in her car, of course). She had been doubtful when I told her about it over the phone, but was taken with its size as soon as she saw it. And it's light and easily foldable, so she wouldn't mind bringing it along when she gets a ride from a friend. As a thank you, she pressed a melon in my hands. A friend had brought it to her as a gift that very afternoon, she said, but it was too large for her to eat by herself, so why didn't I bring it home and enjoy it with my family. 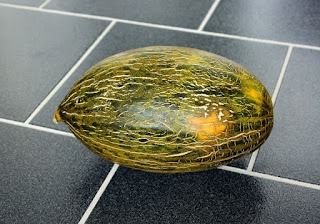 As CelloDad admired the melon, I explained the chain of events that brought it into my arms: How my cousin's driving my dad around after the loss of his driver's license had made my dad give his car to my aunt. Who in return gave me the use of her car for the duration of our stay. Whereupon I brought her his walking aid. Which prompted her to give me the melon. Come to think of it: who knows what favour my aunt had done for her friend, for which the friend had brought the melon in thanks. It was, indeed, entirely possible that the melon had changed hands several times as thanks, in a circle of favour, a whole network of social debt in which money has no place. I made myself dizzy just thinking about it. But the buck - I mean the melon - stops here. I am determined to be the one eating that melon. Besides, it's ripe and it smells great. Wow ... what a story!! I'm curious ... does your dad live alone and, now that you are there and driving him around, has he started speaking again? It's such a "dance" to deal with elderly parents/relatives and their needs. There's their physical safety, and the safety of others, as well as their dignity and feelings to consider. It's not easy! I'm also fascinated by this social debt system. My mom, a first generation Italian American, is very much a proponent of that system. An invitation to dinner means that a reciprocal dinner must be planned. Any kindness must be repaid in some way ... a platter of cookies, shared produce from her garden, etc. Each "payback" is proportional to the kind deed. Like you, thinking about it (let alone participating) makes me dizzy! I truly enjoyed your story ... thanks for sharing! My dad indeed lives by himself now. He was coping rather well, but now we need to re-invent the way he gets around (while I'm not here). The Netherlands has all sorts of mobility help for those who need it, but you do need to want to use it. About social debt: I grew up with it, and first read an account of it in David Graeber's marvelous book "Debt": very fat, and very legible. Among other things, he claims that monetary debt leads, sooner or later, to slavery. Everybody with a mortgage can understand that.